So you have got your rats home, they are currently; attempting to stage a mass breakout from their carrier, hiding under the bedding looking a little scared or sleepy, or maybe they’re bravely sniffing everything and trying to climb up your arm. Generally the babies should be fairly confident and settled immediately, but they are still babies and if they are tired or have had a long day they may well be a little jumpy or unsettled. If the babies are confident and happy then you can have a short cuddle time when you are home, before settling them into their cage. If they seem a bit nervous or uncertain move them straight into their new home and let them rest overnight before properly getting to know each other. Once they’re feeling a bit more settled you can begin getting them used to you. This takes time and even the most social of kittens or adults needs time to adjust to their new surroundings and people and begin to feel at home. Whilst most new babies adapt very well to their new homes straight away with others they can get a bit overawed. This is more common in households with cats or dogs or similar predator animals as they are not yet used to the smell and rats do have an instinctive fear. Most rats adapt to these new smells and sounds within a week or two of moving in, by which time you will be wondering what you’ve let yourself in for. It’s worth bearing in mind that these little ones are very much still babies. Rats do an awful lot of growing up in the 6-8 weeks they are in their first homes, but are still emotionally quite immature. Over the next 4 – 6 weeks they grow from babies into confident youngsters and from there into often awkward teenagers then adults. Through this stage they will look and act differently, as kittens they will be much more prone to getting upset over minor things that “spook” them but likely to have forgotten all about it in a few days. Whilst upset they can often be jumpy or harder to handle. The best thing you can do in these circumstances is to treat them as normal confident little rats. Be too gentle or handle them with kid gloves and they will start to believe there really is something to be scared of. Treat them normally handling confidently as though there’s nothing wrong and they will recover faster. This can be particularly hard if you aren’t used to rats so feel free to ask for tips and advice if needed. 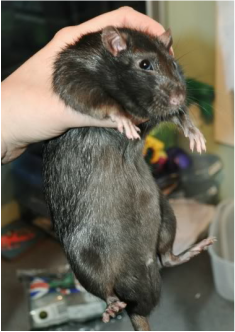 The best way to pick up a rat is to scoop with one hand under their chest and support their bottom with your other hand. With kittens it is possible to pick them up one handed but be gentle as they are only small and fragile. Make sure you hold your rat securely as otherwise it will panic and struggle. A classic sign of this is the rat’s tail ‘wind milling’ (it spins its tail round very fast as it seeks to balance itself). Once your rats become familiar with you it’s likely that they will run up your arm and settle on your shoulder with minimal effort, but it’s worth taking the time and effort to get them familiar with you picking them up, in case you ever need to pick them up quickly in an emergency. Never pick a rat up by the middle or tip of its tail. If in an emergency you need to restrain a rat by its tail (very rare) grasp it firmly by the base of the tail but avoid using it to lift the rat (unless there is no other choice) and never lift or restrain using the mid to end of the tail. This can cause a very painful condition where the top layer of the tails skin is pulled off and leads to the need to amputate part the tail called degloving. Rats are all very different creatures and so need different types of handling. Some rats will benefit from a calm gentle approach, some prefer firmer handling, even verging on manhandling, many fall somewhere in between. It’s up to you to pick up on the signs your rats show to decide which suits them. It can be worth trying a range of behaviours to see how your rats react to it; this will help you decide your longer term approach to that rat. 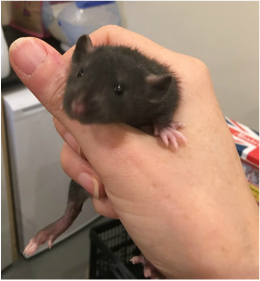 Rats also often change through there life, a kitten generally needs more gentle handling than a big alpha buck, an old rat needs gentler handling than an adult in the prime of their life, and with these changes their preferences will also often change. There are a few different approaches to handling your rats and in general they fit into 2 categories, both have their plus points, both have their down sides. In some cases you may need to adapt things to fit your rats. In reality these approaches represent opposite sides of a scale. You may want to go for somewhere in between depending on the rats. 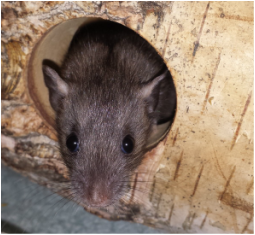 Don’t be afraid of a bit of trial and error, rats may get scared at something but will recover and be fine to start again with later. It’s also fine to do different approaches with different rats. I tend to default to the confidence method but with one rat I ended up somewhere in between designating a safe hammock in the cage where I wouldn’t approach her if she retreated to it, but she was fair game elsewhere. It helped build up trust based on giving her an escape route and a set of predictable rules. I removed the safe hammock once we were happy with each other and she’s not needed it since.